Sometimes I have no idea what I am doing...so instead I put off making decisions by cleaning, baking and getting lost in books. I figure eventually things will work out the way they are supposed to. Then other times I get the energy to make decisions, but then lose it and get lost again. I have to admit that sometimes I am terrible with follow through if I don't get a project done right way. Like right now, my kitchen table is just sitting there waiting to be finished. I should also admit this is probably why I enjoy running and biking, I can feel as is I have immediately accomplished something, while also being able to "get lost" for a bit. I like to get lost in songs too...this an be bad at work sometimes when I zone out for a few minutes at a time...today it was to this song. Getting lost while baking though is not an option...cause you might end up with hard as rock cupcakes or a tart that never sets. I had my full attention on these cupcakes when I was baking. It really felt good to be back in my kitchen, with the task of birthday cupcakes at hand. Plus, when it comes to office birthdays, I want to have the cupcakes or cake come out as I dream them. Light, fluffy and full of flavor. I don't know, there is something about it being for a person's birthday that always makes me want to take it up a notch. These cupcakes did come out light and fluffy. 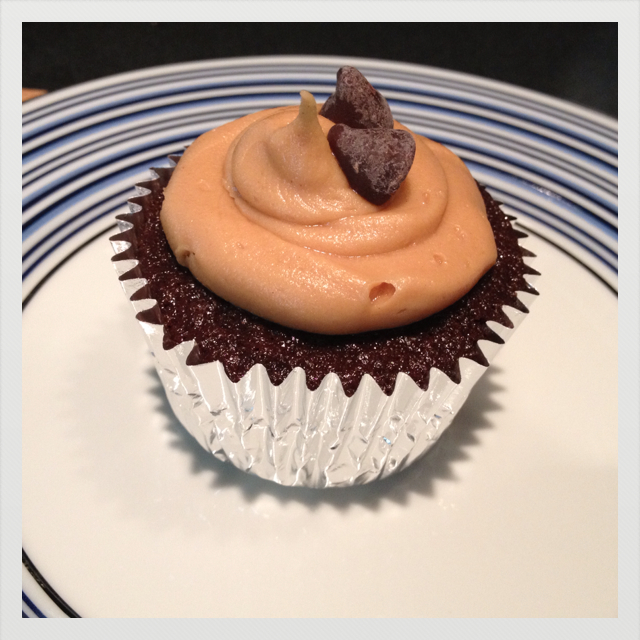 The peanut butter chips are like a treasurer at the bottom and the frosting is smooth and creamy. A co-worker said she could just eat the frosting by the spoonful. These cupcakes are like a buckeye in cupcake form and they will not disappoint. 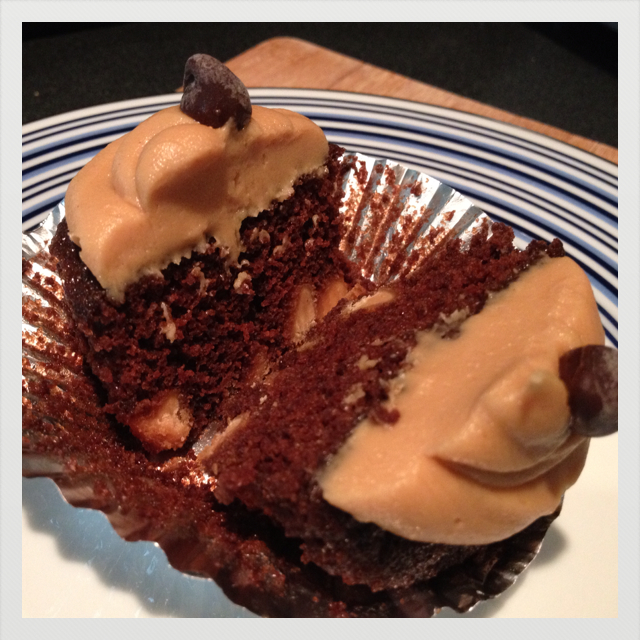 Dry, wet, coffee, peanut butter chips...these are what these cupcakes are all about. A little whisking then a touch of folding action brings the batter altogether. Fresh out of the oven and awaiting the smooth creamy peanut butter frosting. 1. Preheat oven to 350 degrees F. Line two cupcake tins with a total 23 cupcake liners and spray with non-stick cooking spray. 2. In a large mixing bowl, cream together butter and sugar until well combined. Add in vanilla and egg yolks, mix well until combined. If the batter appears dry whisk in 1/4 cup of the coffee. 3. In another large mixing bowl sift together cocoa powder, flour, salt, baking soda and baking powder. 4. Combine milk and remaining coffee in a measuring cup. 5. Add the flour and coffee mixtures to the sugar-butter mixture, alternating between flour and coffee, mixing between the addition of each. Begin and end with flour. Then gently fold in the peanut butter chips. 6. Using a tablespoon or small cookie scoop, scoop two tablespoons or scoops into each cupcake liner. 7. Bake for 18-20 minutes, or until tester comes out clean. While cupcakes are baking prepare frosting. 8. Place the confectioners' sugar, peanut butter, butter, vanilla, and salt in the bowl of an electric mixer fitted with a paddle attachment. 9. Mix on medium-low speed until creamy, scraping down the bowl with a rubber spatula as you work. 10. Add the cream and beat on high speed until the mixture is light and smooth. Once cupcakes have cooled frost as desired and Enjoy!